Engage The Culture! : Resisting That Old Deluder! In 1647, The Massachusetts Bay Colony passed a very interesting law that has come to be known as the Old Deluder Satan Law. It was one of America’s first education acts, enacted for the expressed purpose of making people literate so they would be able to read the Bible for themselves, and therefore not be deceived by those who would try to lead them astray. Those who drew up the Act knew that much error would be prevented if people would actually be able to read their Bibles. It being one chief project of that old deluder, Satan, to keep men from the knowledge of the Scriptures, as in former times by keeping them in an unknown tongue, so in these latter times by persuading from the use of tongues, that so that at least the true sense and meaning of the original might be clouded and corrupted with love and false glosses of saint-seeming deceivers; and to the end that learning may not be buried in the grave of our forefathers, in church and commonwealth, the Lord assisting our endeavors. It is therefore ordered that every township in this jurisdiction, after the Lord hath increased them to fifty households shall forthwith appoint one within their town to teach all such children as shall resort to him to write and read . . .
What was true then is true today. I have been in many discussions – perhaps you have, too – where people will confidently declare that the Bible clearly teaches this or that, when I know that it doesn’t. What they are expressing is something that someone else has told them is in the Bible or taught in the Bible . . . and it isn’t true. Unfortunately, too many people today, including many devout Christians, have never actually read the Bible in its entirety. In fact, many don’t read the Bible very much at all. They read books about the Bible, or devotional books containing Biblical truth, or booksbased on the Bible without actually reading the real thing. Even our churches have a tendency to preach sermons that touch on a Biblical verse or passage without spending much time or effort getting into the actual text to see what the Bible really has to say. As a result, this generation is, in many ways, Biblically illiterate. I can now prove to the English speaking world that I have actually read through the entire Bible, word for word, at least once! That is because my narration of the 2011 revision of The Holy Bible, New International Version has just been released by Zondervan Publishing House and is now available on CD and as a download. I have also narrated the King James Bible, and I have recorded and perform a series of Bible stories I call the World’s Greatest Stories from the World’s Greatest Book. I chose to expend time and effort on these projects because the Bible is clearly the world’s greatest book. To get an idea of how significant the Bible really is, it's helpful to know that the world’s library catalogs list a total of about 40 million distinct book titles, with about 900,000 new books being published each year in a total of 360 different languages. That is a lot of books in a lot of languages. 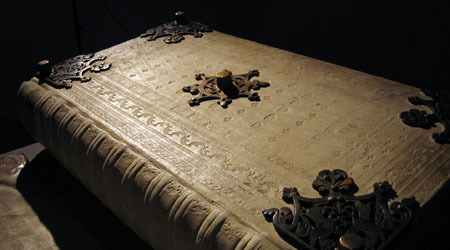 However, according to Wycliffe Bible Translators, the complete Bible has been translated into 457 languages; the complete New Testament into 1,211 languages; and, at least one complete book of the Bible (usually the Gospel of Mark) into an additional 897 languages – bringing the total number of languages having at least one book of the Bible to 2,565! But, not only has the Bible been translated into far more languages than any other book, it has also been distributed in far greater numbers than any other book. Discovering exactly how many copies of the Bible have been distributed is impossible because Bibles have been produced by so many different and unrelated publishers, and many Bibles are given away rather than sold. However, estimates of total distribution for all Bibles worldwide range from about 6 billion to 7.5 billion. Most people know that almost every hotel and motel room in America has a copy of the Bible placed there by The Gideon’s. That organization alone has actually placed or distributed 1.6 billion Bibles and New Testaments worldwide since its founding in 1908, including 79.8 million copies last year. To put those numbers in perspective – the number 1 best-selling regular book of all time is A Tale of Two Cities by Charles Dickens. Since its publication in 1859, it has sold approximately 200 million copies. The Lord of the Rings by J.R.R. Tolkien ranks second at about 150 million copies, with The Hobbit next at approximately 100 million. Other all-time best-selling books include The Lion, The witch and the Wardrobe by C.S. Lewis at about 85 million, The DaVinci Code by Dan Brown at 80 million, and Anne of Green Gables by Lucy Maud Montgomery at 50 million. The Purpose Driven Life by Rick Warren has sold about 30 million copies. As a seminary student many years ago, I was suddenly struck by the thought that I may not have ever actually read through the Bible. I thought that I probably had done so – I had been a Christian for a number of years and tried to read something from the Bible each day. But, I honestly wasn’t sure that I had read it all. And, if I had, I was definitely sure that I had not done so in any systematic fashion. There I was studying and preparing to teach others what Scripture taught, but I wasn’t sure if I had actually read in its entirety the Book that was at the center of my faith. I decided then to make it a practice to read through Scripture from beginning to end in an orderly way – a plan I have kept up ever since. It’s really not very hard. You don’t need a “plan” that someone else has drawn up. You don’t need to read it in a specified period of time. All you need is a bookmark. Start at the beginning, and read through to the end. If you’re a poor reader, download an audio version and listen. As Christians, we need to have a deep love and respect for God’s Word that translates into time being spent actually reading or listening to it! Doing that will enable us to successfully resist that Old Deluder!